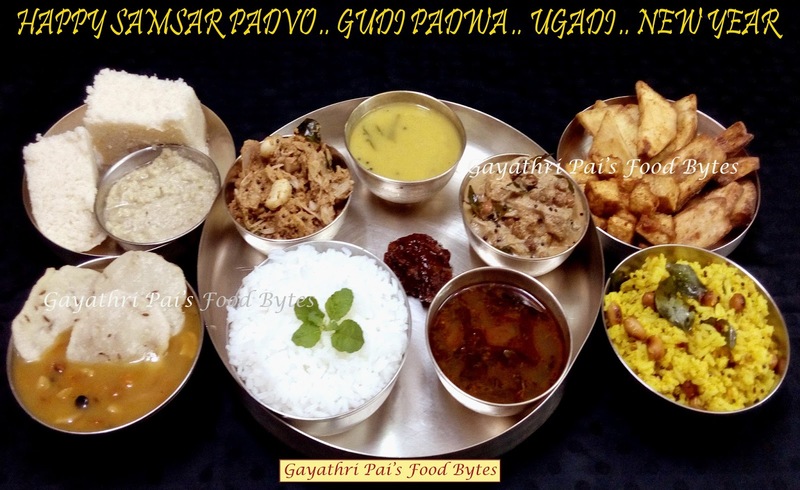 Gayathri Pai's Food Bytes: My Festive Thali 47. About this Festival : Ugadi / Gudi Padwa / Sansar Padvo (In Konkani) marks the beginning of the year for Hindus. This year it falls on the date of 18 th of March 2018. I have already blogged the details of this special day for Hindus in my Blog from last few years during the festive season. So without running into the details I am posting the link of the same at the bottom for those interested to catch on about the traditional day. This year my post got delayed due to unavoidable circumstances … But it is never too late to wish friends. Also the full week uptil “Rama Navami is considered to be Auspicious Day’s” ....... Wishing all my friends a Happy And Prosperous Year ahead with Health, Wealth And Happiness .... God Bless All. ** All the items mentioned above on the list of preparations are already prepared and posted before in the blog. By and large these are the items we usually prepare during this festival, in particular. Some changes here and there are always there as per the region and the likes and dislikes of people. Also sometimes, the availability of the ingredients too depends upon the making of certain dishes. Please go through the search column or in the list on the right hand side of the blog for the recipes. If still not able to find any particular recipe, please contact me via mail, or leave a comment on my Blog or Facebook page for the same and I will def. attend the same as soon as possible. 1.. For Urad~Rice Idly Recipe, Please follow the link given below …. 2.. For Coconut~Ginger Chutney Recipe, Please follow the link given below …. 3.. For Kadgi Chakko (Raw Jackfruit Dry Curry) Recipe, Please follow the link given below …. 5.. For Chane Gash Ghalnu (Whole Black Bengal Gram Curry) Recipe, Please follow the link given below …. 6.. For Kananga Podi (Sweet Potato Fries) Recipe, Please follow the link given below …. 7.. For Surna Podi (Yam Fries) Recipe, Please follow the link given below …. 8.. For Harve Kele Podi (Raw Banana Fries) Recipe, Please follow the link given below …. 9.. For Mavinkai Chitranna (Raw Mango Seasoned Rice) Recipe, Please follow the link given below …. 10.. For Chane~Tomato Saar (Whole Bengal Gram ~ Tomato Saar) Recipe, Please follow the link given below …. 11.. For Limbiya Nonche (Lemon Pickle) Recipe, Please follow the link given below …. 13.. For Madgane (Chana Dal Payasam) Recipe, Please follow the link given below …. 14.. For Rasvodo (Rice Vadas) Recipe, Please follow the link given below …. ** To read about Ugadi / Gudi Padwa Celebrations, Please follow the link given below ….